Many of the data-driven processes we rely upon are often opaque, discrete, or occur distant or hidden to us; often only noticed when they malfunction or fail. This situation is made further complex when our aesthetic experience of data is commonly mediated through methods such as visualization and sonification, methods which introduce new layers of interpretation and bias between ourselves and data. By examining datas presence in culture and its overt and covert impacts on our lives, artistic practice can produce works which expand our understanding of datas many roles in contemporary life. This talk explores sound artist and researcher Wesley Goatleys on-going artistic practice of critical data aesthetics which considers how sound, sculpture, visual and spatial techniques can re-shape how we think about and engage with datas materiality, provenance and politics. Wesley Goatley is a sound artist and researcher in critical data aesthetics. His artistic practice examines opaque power and hidden processes in technology and data through installations, software, and talks. Upcoming commissions include Ground Resistance with technology anthropologist Georgina Voss for the Milton Keynes International Festival, in assosciation with the Open University. 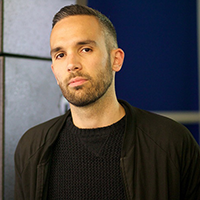 His doctoral research is located at the Sussex Humanities Lab, University of Sussex, where he is developing critical approaches to the practice of data aestheticisation.